Screen grab from video of a man driving a toddler around Male' City on the basket of a motorcycle on April 2, 2019. Transport Authority has suspended the license of three people under investigation by Maldives Police Service for traffic violations, including the man caught on video driving around a toddler on the basket of his motorcycle. 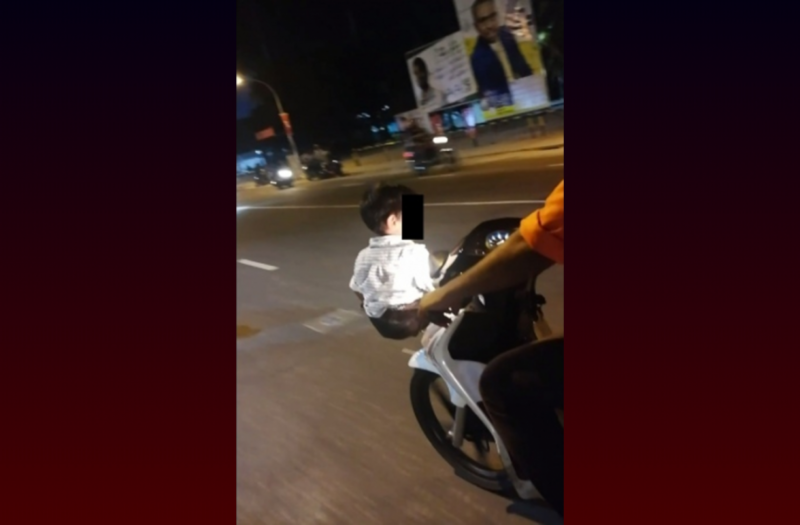 The man, later identified as a police officer, was caught on video driving a toddler around Male’ City on the basket of his motorcycle on April 2. Maldives Police Service reports the Transport Authority has suspended the license of the man for the duration of one year. The second person whose license was suspended is the person behind the wheels of the taxi car which crashed into the road divider on the Hulhumale’ Highway on February 18. The taxi had been driving over the speed limit when it crashed. Transport Authority suspended the license of the taxi driver for the duration of two years. The third person whose license was suspended is the person behind the wheels of the van which hit a female pedestrian in Th. Thimarafushi on March 12. The accident resulted in extensive injuries to the pedestrian. Transport Authority suspended the license of the driver for the duration of two years. Maldives Police Service reports the Transport Authority suspended the license of the three people under Article 63 (c) of the Land Transport Act. Meanwhile, the Transport Authority has also suspended the driver’s license and revoked taxi permit issued to the taxi driver involved in the hit-and-run in front of Senahiya Hospital on February 12. 720 roadside accidents have been reported to Maldives Police Service so far this year – 98 accidents in April alone.